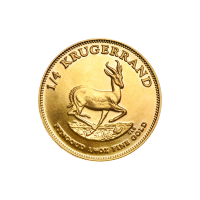 뒷면 A Springbok Antelope with the mintage year on either side and the words "KRUGERRAND FYNGOUD 1/4 oz FINE GOLD". 1/4 oz Random Year Krugerrand Gold Coin 크루거랜드는 금으로 남아공 시장을 돕기 위해 1967년 처음 주조되었습니다. 이 상품은 남아공 가우텡 이스트랜드의 한 도시인 저미스턴의 랜드 리파이너리에서 제조되었습니다. The name itself is a combination of "Kruger" (a past president of South Africa) and "Rand", the South African currency. The Krugerrand is minted from a more durable copper-gold alloy often referred to as "crown's gold" because of its use in English gold sovereigns, among others. 금 함량 91.67%(22kt), 구리 함량 8.33% . 크루거랜드는 세계적으로 가장 인기있는 금불리언 동전 중 하나이며 1980년까지 90%의 글로벌 금화를 차지했습니다. 이 동전은 품질과 신뢰성이 동일합니다. 이 변색, 스크래치, 또는 사용흔적이 보이는 동전들은 할인됩니다. 중량과 순도는 보증되지만 연도와 상태는 유효합니다.